The most basic form of information collection is an ordinary conversation. Everyday conversation is extended and formalized as an in depth interview. This is a type of data collection and varied from structured or standardized interviews. Such types of interviews are ones where the respondent receives fixed set of response categories. An in depth interview is defined as a qualitative research technique where, intensive individual interviews are conducted. In such interviews there are smaller numbers of respondents so that on a particular program, idea, or subject the respondent’s perspectives are explored. An in depth interview can also be mentioned as a loosely structured interview which permits freedom for both the interviewer and interviewee in case of changing directions and also exploring additional points when required. In-depth interviews are varied from survey interviews where they are less structured. When survey interviews are considered they have a rigid structure where questions are formulated and asked in a sequential order and the same old answers are defined. When in-depth qualitative interviews are considered, it is continuous and flexible. Such kinds of interviews are not prepared well in advance and are also not a usual one. When program evaluation and market research is considered, in-depth interview has a variety of roles to play in. An in-depth interview explores the various boundaries of a problem. They are able to obtain the context of any problem, the interview is able to evaluate potential solutions, and finally an in-depth interview is able to manage the research process as they assist the interpretation of results from other quantitative methods and surveys. When research is considered, in-depth interviews helps in determining the knowledge insights and spectrum for any product, service or program. There are few features that need to be glimpsed through in an in-depth interview. The main feature of an in-depth interview is the blend of flexibility with structure. Though the interview is much unstructured, few themes would be covered by the interviewer based on few topics or guides. When structure of the interview is considered, it is flexible and covers up areas and topics appropriate to the interviewee, so that exploration and probing is made possible. By this way the researcher or the interviewer is made responsible to all questions and issues raised by the interviewee. The other main feature of an in-depth interview is that it is interactive type. During the course of the interview, the material is produced between the interviewer and interviewee’s discussion. The interviewer puts forward initial questions in a positive manner so that the respondent is encouraged and boosted up. The third feature is that the respondent uses many probing techniques, so that the insight to the answer is accomplished by means of exploration, penetration as well as explanation. In this type of interview, the interviewer makes use of follow-up questions so that a deeper perspective and insight about the participants meaning is obtained. The fourth feature discussed is that the interview is of generative type as new knowledge and thoughts are developed at some instance during the interview. Ideas and suggestions are put forward by the respondents or participants in the interview for a specific topic and also solutions are put forward for any issues raised for the same. An in-depth interview can also be defined as a discovery oriented or open-ended method which is mainly followed in order to obtain detailed results about any topic from stake holder. This qualitative research method helps in finding an in-depth view of respondent’s experiences, feelings, and perspectives. At the initial stage of larger research projects, an in depth interview is conducted in order to narrow down and focus on research. There are very few steps involved in conducting an in-depth interview. The first step involved in conducting an in-depth interview is by developing a sampling strategy. The second step would be writing down an in depth interview guide which involves the questions that are associated with the interview. The next step would be conducting an in-depth interview and finally would be analyzing the data obtained. In-depth interviews are appropriate and beneficial when a detailed report of any individual’s thoughts or behaviors are required. The interview is also conducted when new ideas are explored or new issues are viewed in-depth. This type of interview is one which offers context to other data where it represents a complete picture of what took place and why. Instead of focus groups, in-depth interviews can be conducted when individuals are not interested in discussing openly in a group. The main in-depth interviews advantages is that, other methods for data collections like surveys can also be utilized in order to obtain information for comprehensive data. With the help of surveys, a friendly scenario for people is developed where they are able to fill their ideas as well as thoughts and also the feedback and results are obtained in an accurate manner. With the help of in-depth interview, the interviewers are able to understand their respondents deeper. The interviewers are also capable to obtain an insight of the respondent and gain more knowledge than any focus group. It is believed that, an in-depth interview is faster in its process. The recruiting and scheduling in an in-depth interview is quite faster when compared to others. When an in-depth interview is considered, it helps yield data by the interviewers and the data obtained is mentioned to be rich data with enhanced insight and more of details. This beneficial factor is the main reason to conduct in-depth interviews. An in-depth interview is a direct face to face interview and there is no media factors involved such as telephone, video etc. Group interaction is mostly avoided in an in-depth interview. In an in-depth interview, the individuals gain an opportunity to explore the given topic and gain or offer deep ideas. Hence in-depth interview is one that paves way for opportunity. With an in-depth interview, the interviewer is able to explain or clarify queries involved and also enhance the useful responses too. In that manner, the interviewer is thus benefitted with this type of interview. An in-depth interview offers a relaxed atmosphere for ones who desire to gather data. People will find it easy and comfortable in an relaxed environment by having conversation with one to one rather than going in for filling forms. With the help of in-depth interviews, individuals are able to share their opinions where there is no bias from other participants. It is in focus groups that only a very few would answer and offer ideas. High quality of data is obtained from individuals as they are interviewed one to one and not by hearing from other participants. Since more information is drawn out from an in depth interview, there is always high value for every participant. By this way the return of investment is considered high when compared to focus groups. The budget is mainly utilized to collect data from respondents than to cover incidental costs for presenting focus groups. There are certain in-depth interviews which are conducted by phone and are considered flexible and cost effective too. When very short time is spent with the respondent, the interviewer or the interviewee would be not be able to conclude if they are a perfect fit for the job. The capability to find out if you would be a perfect fit for the organizations culture takes more time which can be achieved by means of an in-depth interview. There are also in-depth interviews which takes place during lunch or dinner in order to monitor how interviewees interact with others social as well as party business settings. An in-depth interview is something where the candidate isn’t rushed out. The candidate can explain his skills qualifications, experience in a detailed manner. The candidate can answer every question with the work history and experience and impress the interviewer. In-depth interviews are a time consuming evaluation activity as it takes more time for conducting an interview. More time is used for conducting interviews, transcribing them, and analyzing its results. During the planning phase for an in depth interview, time must be included for transcription and for analyzing data. For conducting an in-depth interview, a trained interviewer with knowledge in interviewing techniques is required. This will assist the interviewer in gathering rich and detailed data from the interviewee. Also the interviewer must possess the capability to make the respondent comfortable and make him interesting in whatever is being said. The interviewer should possess knowledge about the latest interview techniques to be used. Some of the techniques would be avoiding yes/no, as well as leading questions, making use of the right body language, and also monitoring the personal opinions in check. For ones who take notes about the respondents in an in-depth interview method must be ready to make long compilation of notes. Though there is no requirement for notes to share with others, but still it is mandatory to review and put them in the right manner. It is quite tough to follow notes in an in-depth interview and organize them. Comparison of candidates after an in-depth interview is quite tough when compared to structured interview. When the same structured question is asked to candidates in a structured interview, it is easy to weed out the ones who aren’t fit for the position. When an in-depth interview is considered, the discussion of the candidates is completely in another direction which makes it tough to compare its abilities and skill sets. Generalizations of results are made tough in an in-depth interview as small samples and random sampling methods are utilized. Valuable information is obtained with in-depth interview when other data collection methods are used. Since these in-depth interviews take up more amount of time, very minimal number of interviews are achieved for a fixed period of time. Since an in-depth interview is an opportunity to discuss more ideas. There are more chances for the interviewer to ask for illegal questions too, for example a candidate can be asked about his college graduation and year, if the age is more than stipulated age questions may step forward for reason, then into age, ethnicity, reason, religion, beliefs, family, sexual orientation and lot more. These are a few disadvantages that lead to an in depth interview and its related activity. An in-depth activity needs to follow few steps so that the interview is conducted in the right way. The interview panel requires planning for the interview developing tools required for the interview, training data collectors, collecting data, analyzing and disseminating data. 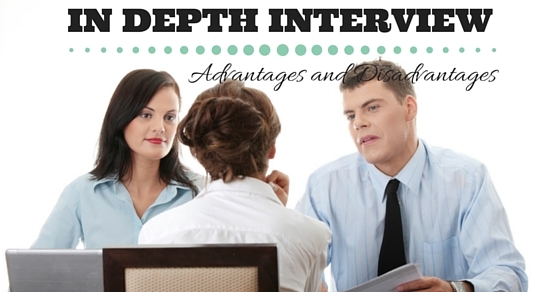 These are few aspects about in depth interviews advantages and disadvantages and what it actually is. The steps required in conducting an in-depth interview, the way they are formulated are mentioned in detailed manner. More over people who were muddled about what an in-depth interview is, can find it simple and easy after reading the beneficial and clear points mentioned above. There are many concerns that follow an in-depth interview in order to gather valuable data and move towards the right success path. With all these points, it would also be useful if the interviewers and interviewees run through various other sources and gain good knowledge. In-depth interviews are famed and getting a good insight about the same is beneficial.